If you’re worried about not being able to stay on top of your normal fitness routine during your Hawaii vacation, then the Koko Head hike on Oahu is a trail for you! 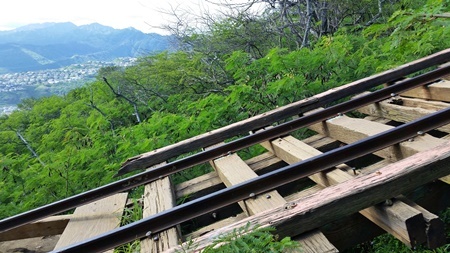 The proper name for this trail is the Koko Crater Railway Trail. But if you say Koko Head hike, it’ll be generally understood to mean that you’re talking about the railway trail. This is a popular trail on Oahu that’s known for giving you a good workout, and it’s easy to get to Koko Head by bus from Waikiki. You may hear this hike being referred to as the nature’s stairmaster. This is because you are quite literally taking stairs all the way to reach your final destination, which is the Koko Crater summit. This also gives it the name of the Koko Head Stairs. Is the Koko Head hike hard? In terms of distance, this hiking trail is short. It’s less than a mile to reach the end of the trail. But short does not always mean easy! And that’s most certainly the case here! Even if you think you are in reasonable shape, there’s a good chance you will find this hike to be a challenge! If you’re training for a long distance triathlon or a marathon, there’s a good chance this will end up being a good cross-training workout for you! This also means that it’s not a good idea to attempt this hike if you are not used to challenging your cardiovascular system. That doesn’t mean you can’t attempt Koko Head. The stairs: How many steps does Koko Head have? The Koko Head Stairs may be stairs, but they are not ordinary stairs. As an old tram line turned hiking trail, there isn’t much regularity in the steps. Sometimes there are short steps, and sometimes there are taller steps. For short people, the taller steps sometimes makes for a little bit extra work. This is true in both going up the steps and down the steps. 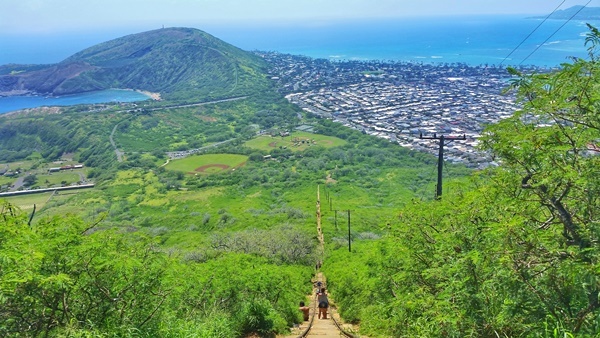 The Koko Head stairs are said to be 1,048 steps. But again, these aren’t your normal stairs. The height of the steps varies throughout the trail. The trail may also have loose dirt and gravel, making it easier to slip. So be sure to watch your footing and take caution! Note that you may see people racing up and down these steps. They are most likely locals who have done the trail many times and have the experience to know the trail well. If it’s your first time on this trail, it’s not recommended that you do the same! In this case, don’t do as the locals do! The closer you get to the summit, the steeper it gets! And don’t be alarmed if you hear loud sounds that resemble gunshots. The Koko Head shooting range is right nearby! Okay, so it may not be that secret of a path, but if it’s your first time going up the Koko Head stairs, the path is easy to miss and simply not know about. In fact, most people just keep going up this main trail. But for some people, the exposure to the hillside of this portion of the railway can look a little scary. This is the only part of the trail that the railway goes across an open area and that your footing is exposed to an open area down below. Once you reach the the exposed railway, have a look to your right. You’ll find a path that veers off. That can take you up to avoid the whole stretch of the railway that’s exposed to the hillside. This alternative is not too difficult. This is a pretty small portion of the trail. It’s probably about 5 minutes, if that. How long does it take to climb Koko Head? Overheard conversations start at 25 minutes on the low end to reach the summit! But if you’re the average Hawaii tourist, there’s a good chance you won’t reach the summit in under 30 minutes. BUT… if you are in good shape, you could truly use Koko Head as your workout and go for it! If you do go for it, you definitely want to take something like THIS that’s a hiking backpack and hydration pack in one to make it super easy to drink water without stopping to take a sip! But back to most people who climb Koko Head. It would be safe to allow a couple of hours for the Koko Head hike. You’ll also probably want to spend some time at the summit taking in the views in all directions. The way down isn’t as strenuous as the way up, but it still may take time getting down the stairs carefully in some parts. So, give at least 1.5 – 2 hours to fully enjoy this trail and allow yourself ample time for rest. Consider taking some snacks or a light meal for a picnic at the summit! Once again, this hiking backpack makes the perfect companion when you’ve got plans for a picnic at the summit! This snack (pictured above!) 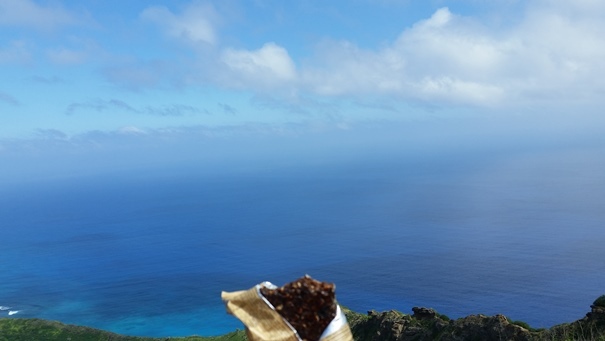 makes a perfect hiking snack for your break, or to pack as extras in the case of emergency when you’re running low on fuel when you least expect it for all of your Hawaii hikes! After a few dozen (or few hundred) steps, you may start to feel like you’re getting in a workout with the Koko Head hike! Don’t hesitate to rest for a few minutes if you need to before getting back on your way. It’s quite common to see people step off to the side to do so. Whether it’s hiking sandals (these are the best types of shoes to wear hiking in Hawaii), or at the very least something like running shoes, it’s a really good idea to NOT wear flip flops on the Koko Head Hike. It’ll probably be a hot day when you go, the sun will be shining down on you, you’re doing a strenuous workout, and you’ll be sweating. While the trail itself doesn’t have shade, in some areas it’s possible to step off to the side and find a bush to sit or stand under. But other than that, it is a largely sun-exposed trail, so prepare accordingly. A hat is a good idea. It is also a good idea to bring snacks along. You’ll probably be on the trail for close to 2 hours, and again, being a strenuous workout, refueling yourself with a little bit of energy can go a long way. Even if you don’t plan on eating much (or at all), bring along extra energy bars just in case. If you do feel a lack of energy, a few hundred calories can do a lot in making you feel re-energized! Remember that thing about this hiking snack that makes for emergency food! Once you reach the summit, you can take in the views, rest up, and have a little bit to eat too before you head back down! 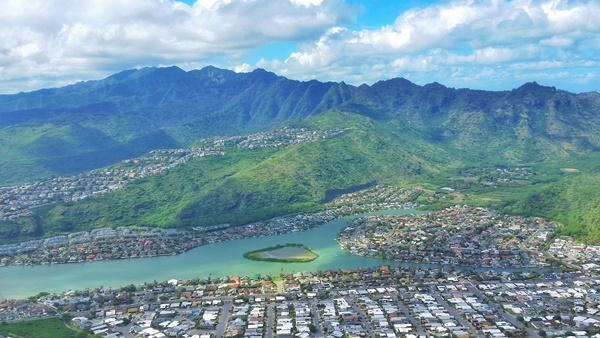 Here are more tips for hiking in Hawaii. It’s completely normal to take tons of breaks climbing up the Koko Head trail. So don’t hesitate to step off to the side and rest up when you need it! As noted earlier, the dirt is easy to slip on in some parts. You may see or hear people slip now and then, which is also a good indication to be sure to wear footwear with traction. This is a main reason hiking sandals are a good idea. It will do a much better job at keeping you safe than some other types of footwear. Climbing the tramline can be exhausting and physically challenging. Be prepared with water, shoes, and sun protection. Drink often to avoid dehydration and heat exhaustion. Watch your step. Step with caution and go slow. Rest often. A misplaced step could make you slip and fall. Tramline is steep and not maintained. If you proceed, be alert. If you trip or fall, you could be seriously injured or killed. If in doubt, stay away. 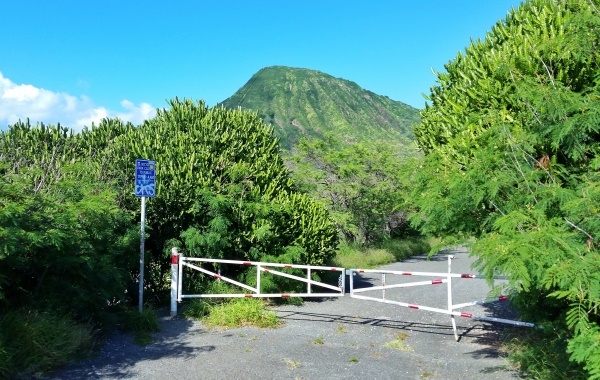 There is parking available at the Koko Head District Park, which is where the trailhead is located, and it’s a fairly easy drive from Waikiki. You can typically expect the drive from Waikiki to Koko Head to take around 30 minutes. If you’re driving from Waikiki and you see a sign for Hanauma Bay, you’ve gone too far! Koko Head is also easy to reach by bus from Waikiki. 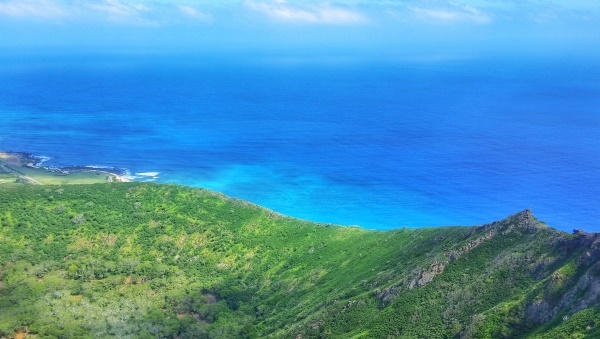 If you’re looking to get to Koko Head by bus, see How to get to Koko Head Trail by bus! Down the road in the direction that you came from towards Waikiki, there’s the Koko Marina Shopping Center. In the shopping center is Paina Cafe where you can have a taste of the traditional Hawaiian dish known as the poke bowl! PERFECT post-meal workout at a Hawaiian style restaurant! They have plate lunches, sandwiches, and salads too, if you don’t want to go for the poke bowl. You can take a look at the Koko Marina Paina Cafe menu here. A perfect recovery to a strenuous workout would be some light swimming or snorkeling! Hanauma Bay is located just across the street from Koko Head. You can bring along your own snorkeling gear or rent snorkeling gear at Hanauma Bay! So after you grab a bite to eat at Paina Cafe, you can head back down the road to Hanauma Bay. There is an admission fee, and you can see Hanauma Bay prices here. Or if you want to skip the snorkeling but still get the iconic views of Hanauma Bay from above, with a $1 parking fee at Hanauma Bay, you can access the overlook! If you’re arriving by bus to Koko Head, just walk right on over to Hanauma Bay from Koko Head, no fee required!